This is a two-part lesson that will familiarize students with the mechanics of Minecraft — specifically, how to collect and craft materials. The first part consists of whole class instruction, and the second part is students on the game. In this lesson, students will make a crafting table, construct the five main tools needed to build the various structures (house, road, subway station) in other related lesson plans. Furthermore, they will calculate how much of each material they will need (Optional: using an Excel spreadsheet). Note: This lesson serves as a good introduction to students completely new to Minecraft. Click on the link above to view our explanations of how this lesson plan is aligned to specific Common Core Math Standards. On a projector, open a Survival World in MineCraft. Show students how to collect wood by ‘punching’ a tree (video on the down). Have students write down how much wood is collected. Push “E” on your keyboard to pull up your inventory and point out the four-square crafting section and left-click to pick up all your blocks of wood. Left-click again to put down all your wood in the four-square crafting section. Shift-click the output to bring your planks down to your inventory, under the planks icon there will be the number 4. This means you have 48 planks. Note that planks must be aligned vertically to create sticks. To craft sticks, pick up all your planks with a left-click. Next, right-click (to put down planks 1 at a time) 2 planks at any vertical point on the crafting table. Now try it with 3 planks. Right-click 3 planks into the input. You will see it will still craft 4 sticks and 1 plank will be left in the input. You do this to show you that sticks can only be crafted with an even number. Have students use the last two equations (Planks/4 = Wood & Sticks = 2*Planks) to find out how many sticks are created from 1 block of wood. Optional: Have students input these formulas into an excel spreadsheet for future reference and quick calculation. The spreadsheet should indicate how many planks and sticks can be crafted given the amount of wood. Show students how to craft the five main tools: shovel, sword, pick axe, hoe, and axe. 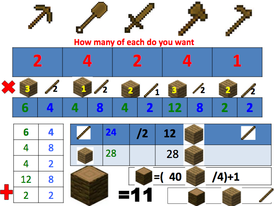 Explain to students that they will need these tools to survive and build their town in Minecraft. 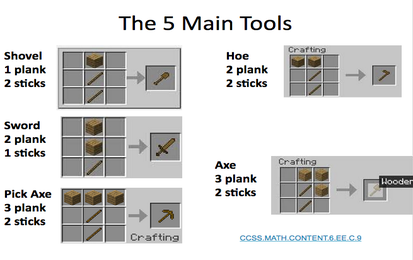 The image below shows how many planks and sticks are needed to craft each tool. This is an example of student work, showing how many of each tool they want to craft, and the amount of planks, sticks, and wood needed. How to craft torches, chest, and furnaces. How to make a dig shelter. If not done yet, have students go on the computer and sit with their group partners with their paper spreadsheets. Then, have students use their spreadsheets to determine how many of each tool they want to craft and calculate the number of the materials (wood, planks, and sticks) they will need. Set up a Survival World in Minecraft for the students to go on and have them test the results of their spreadsheet in-game by making their tools. After students make their tools and check their work, challenge them to survive! Have them mine for coal, make better tools, and hunt for food. Teleport all students back to the spawn point and share coal and food with other. Turn the difficulty to hard and set the time to sunset. Challenge groups of three to go build a home to be safe during the night time.